CMSE provides a top quality ATEX support service to our clients nationwide. We have extensive ATEX experience and a proven track record in providing these services across many industrial sectors. Our ATEX consultants have both process and electrical safety expertise which makes our solutions both legally compliant and beneficial from the perspective of potential cost reductions and savings. 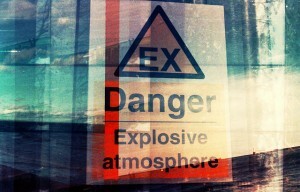 The ATEX Regulations apply wherever an explosive atmosphere may occur. An explosive atmosphere is a mixture with air, under atmospheric conditions, of flammable substances in the form of gases, vapours, mists or dusts in which, after ignition has occured, combustion spreads to the entire unburned mixture. At Chris Mee Safety Engineering, our consultants perform Explosion Safety Management Reviews for defined areas and activities within the plant. By carrying out an on-site walk-through inspection of the plant our Process Safety Engineers will identify possible lapses in order to control the explosion hazard in the workplace. S.I. 299 of 2007 transposes into Irish Law a European Directive called the ATEX directive No.1999/92/EC and is concerned with the risks from fire and explosion arising from flammable substances stored or used in the workplace. The regulations apply to most workplaces where flammable substances are stored or used for example where flammable liquids or flammable dusts are present. Additional recommendations will be given to the client at the end of the performance of the assessments to be implemented in order to control the explosion hazard. At Chris Mee Group our first aim is eliminate the risks and mitigate the possible effects of the explosion hazard in the workplace. Additionally, our Process Safety Engineers at Chris Mee Group can carry out an investigation if an explosion accident has occurred on site. They will gather witness accounts and all relevant background information. They will also review available direct and indirect evidence for accuracy to define the most likely sequence of events and probable cause (s) of the explosion accident. The proper analysis will include consideration of both material and human factors. Safety system deficiencies, system malfunctions and hazardous conditions will be identified. Specific recommendations, to prevent recurrence of the accident, including both operative and protective measures. Directive 94/9/EC applies to equipment and protective systems intended for use in potentially explosive atmospheres. The suitability of mechanical and electrical equipment intended for use in potentially explosive atmospheres is determined according to its group and category. Carrying out Hazardous Area Classification and Explosion Risk Assessments on site, our Process Safety Engineers, will determine the type of equipment suitable for the ATEX area. Flammable properties of the substances, Temperature and Pressure of the process and basis of safety on place will be also relevant for the study.